If anyone would have told me when I was in my 20’s that I would be running in 5K races when I’m in my 50’s I would have told them they were cuckoo bananas! I loathed running. I liked Jazzercise (the Zumba of the 80’s), golfing and bowling~~the latter two especially because you can drink beer while participating! But here I was today participating in my 5th 5K! 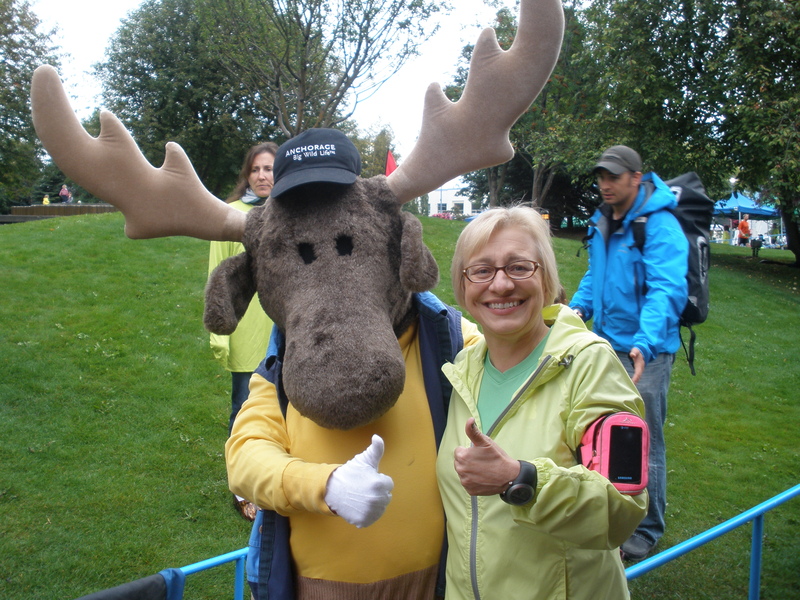 It was a good one too as I got to run through the streets of Anchorage, along the Tony Knowles Coastal Trail, and in the midst of the 2012 Iditarod Champ, Dallas Seavey. There was also a lot of music…a real live cowboy sang the National Anthem, and a troupe of native Alaskans did a tribal dance about running and there were even some Scottish bagpipers about half way along the course. Alaskans are a very eclectic group to say the least! …well they gave everyone a nice shiny medal, but it’s the thought that counts! 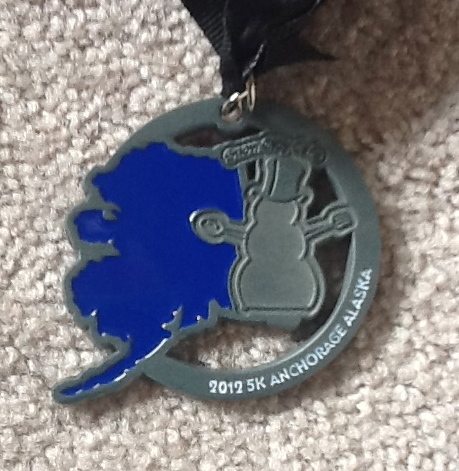 This entry was posted in Alaska, recreation, travel and tagged 5K, Alaska, Anchorage, Anchorage Alaska, Anchorage Running Club, Big Wildlife Runs, Iditarod, Jazzercise, Running, Sport, Tony Knowles Coastal Trail by Tracy 'jottingswithjasmine'. Bookmark the permalink. one of your best posts! cuckoo bananas? why can’t I write things like that? and that shiny medal . . . I am one jealous lower-fortyeighter. I bet you are jealous!! Am really impressed that you are running 5K – I’m not doing more than 5 metres some mornings!!!! The Alaskan run sounds like a wonderful experience. And as for Scortish bagpipers – I often think they are like Irish pubs – there are some in every town and city in the planet! The problem is that the race was three days ago and I’m still recovering!! The bagpipers were certainly a surprise but I bet you’re right about their existence in all corners of the globe.